Franklin Holmes Community Center was a unique plot in its immediate area for one major reason: the building itself covered a footprint that was much smaller than the remaining property that surrounded it which was mainly a paved lot. It used to be a lumber/hardware store which would account for all the space around the building and the ample parking. The store went out of business at some point in the mid-90’s, the reasons being that: a) the original owner handed the business off to an incompetent son and b) Home Depots started pulling business away from it. The owner’s son sold the property to the city who in turn tried their less than best to convert the space into a community center. It was a tad awkward inside but the center was well-loved by its patrons. The front door was a thing of the past and clearly a leftover from the store (in fact, the whole outside looked original, save some paint). It was one of those automatic opening doors that simply swung open and into a metal railing when you stepped on a black mat that was between two railings in front of the door. I don’t know which surprised me more: the fact that a community center would have allowed what could be a dangerous device or the fact that the door still worked. The front room was large with a receptionist window that looked into a small office. No one was in the window but that was probably due to the recently smashed glass that left sharp pieces all over the receptionist’s desk. There were also three areas of spray-painted graffiti on the walls. Eventually a door opened and a woman in her mid-forties approached us. Lily definitely seemed a bit distracted. I wasn’t sure if that was due to being at the head of a community center that was under attack or because there was a sleeveless gentleman in front of her holding a 2X4. As she spoke, her speech started in a very neutral position but slowly grew to the point where tears were nearby, “We’ve had to hire a handyman to fix all the damage but he can barely keep up with the vandals and it’s costing us so much and members are starting to leave and it won’t be long before we have to close the…I’m sorry.” She closed her eyes as if to hold back tears. The tears did not come but she erratically wiped her fingers under her eyes as if they were there. Lily walked me down a corridor, took out a key, and unlocked an unmarked door. Inside was a closet that served as the CCTV system hub and a janitor’s closet. 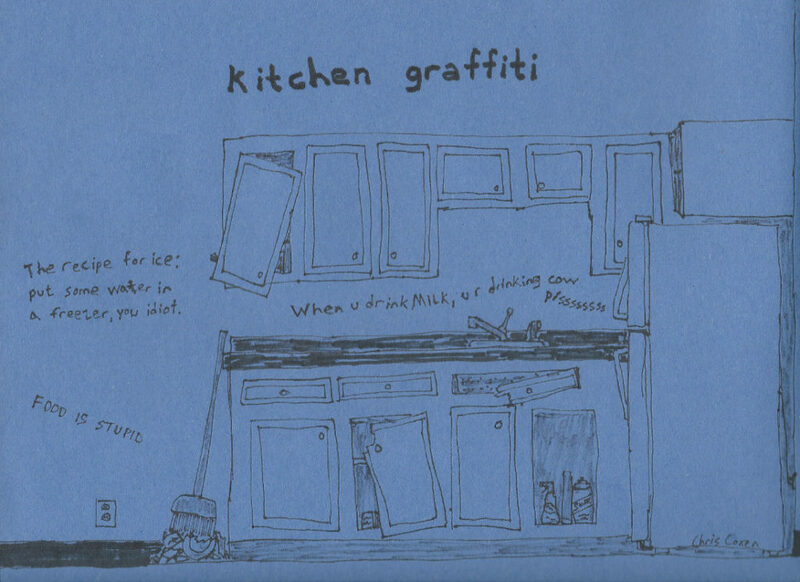 The CCTV rack was roughly three feet from a sink used to wash out mops and paint brushes and many other grim objects. I was amazed the CCTV components were still working as they had been clearly splattered with all kinds of detestable liquids over the years as evidenced by countless dried up drip marks that left behind questionable residue. The system was old and therefore the recording was done with a VCR. “Would you mind if I looked at some of the tapes?” I asked her. Lilly locked the door. I noticed there was no forced entry into the closet so my guess is that the vandals somehow found a key or picked the lock to gain access. 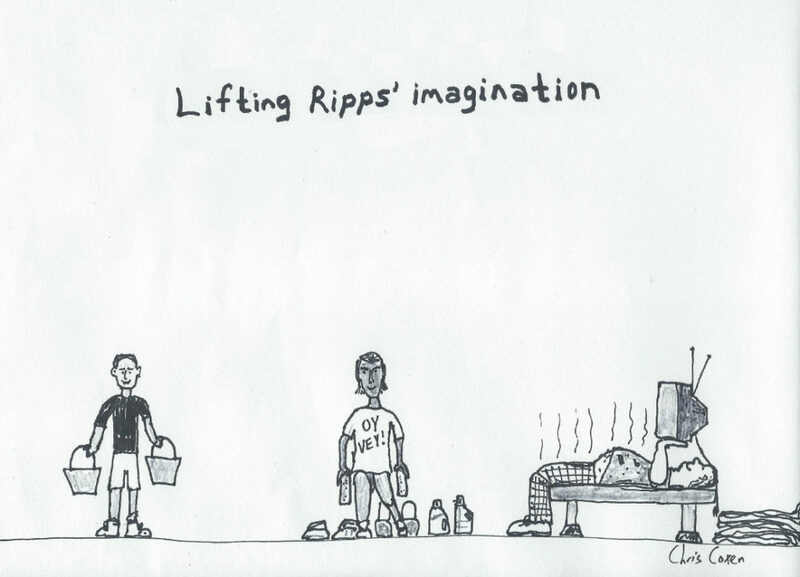 Ripps walked into a small weight room and found three oddly matched souls. The three appeared to be doing weightlifting motions but with no weights. There was a Hispanic boy of about 12. He was doing a curling motion. The second was an overweight white man that may have been homeless. He was lying on a bench and bench pressing nothing. The third was a fit black woman in her early 70’s with a hairdo that could only be described as immaculate that was wearing a large t-shirt that said “OY VEY!” in green letters that appeared to be brushed on. She was doing lunges. Ripps found this all to be disturbing. “That ain’t right.” That was all Ripps could say. He stood there watching them. He was mildly upset about a community center being vandalized but now it really angered him. 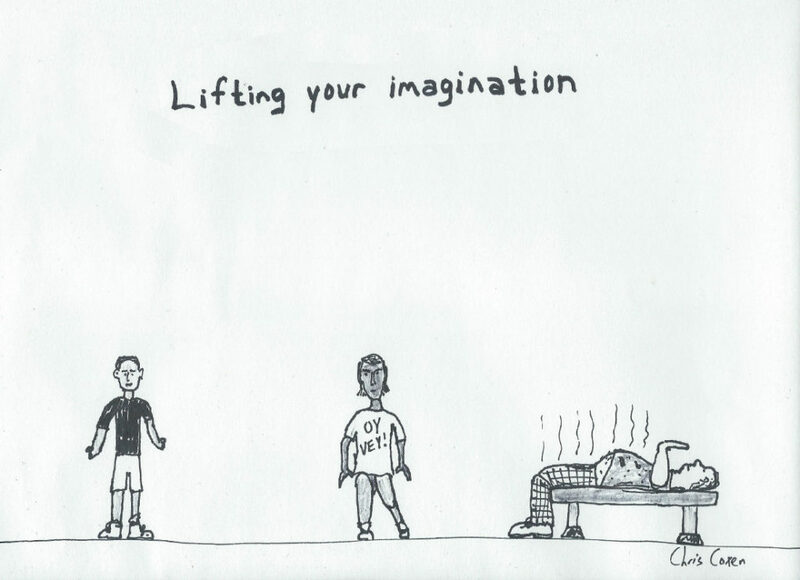 Ripps looked at the boy and remembered a time when he too had no weights to lift and was forced to use his imagination. I opened the door to check on Ripps’ handiwork and was amazed. The boy had been given two identical pails that had the same amount of water in each. This was great since he could now adjust the weight and the fact that it was filled with water forced him to have proper, steady form so the water would not splash everywhere. The woman was now lunging with a brick in each hand. Behind her, organized in twos were various objects that one could hold that appeared to be various weights but roughly the same as its partner. The man on the bench made me a little nervous. He was bench pressing an old television. Behind the bench on the floor were a several moving blankets whose purpose I assume was to act as a safe place to dump the TV when the man got tired. It was a strange scene but all three had some variety of smiles on their faces. Judging from his demeanor, it looked like my words did have some impact but it was hard to tell how much. Hopefully Ripps’ pride would dissolve enough to the point he could see that Fred presented no threat to him. Amanda Pimmsley had gotten word earlier in the day about our arrival. Otherwise, she hopefully would have sent this peculiar stranger packing. She nodded and made a “the stage is yours” motion. 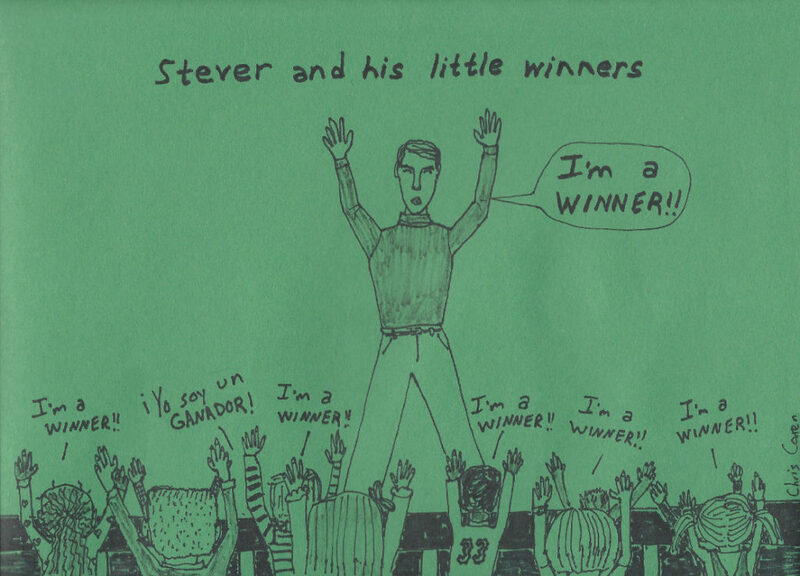 Stever was used to what he had in front of him, an audience that was a slightly confused and timid. The tiniest err in content or delivery and he would lose them. Stever loved this challenge for he knew that if he could win someone over that was dubious in the beginning, he would have them for life. In fact, he liked to go one step further and literally lose the audience and then win them back. Such a move was “signature Stever” as his motivational speaker peers would say. A child timidly rose his hand. Stever asked him to speak and the small boy did so, “I feel fear right now.” This was it. This was the place Stever wanted to be: the first moment of losing his audience. Now it was time to bring them back by building them up. “I’m on the edge!” Stever directed. Ripps arrived at the last security camera, next to the bathroom. He could hear some sort of construction work being done nearby so he repositioned the camera with the help of Linda as quickly as possible. Like the space oddity he is, Ripps spoke to a piece of wood. “Those protein shakes are hitting me. I gotta take a leak so you wait here. I’d take you with me but the bro’s room ain’t no place for a broad.” Ripps set Linda down just outside the men’s room door. Immediately after Ripps entered the bathroom, Carl the handyman came out of a nearby door. He was probably about 50 but because this man clearly did not take care of himself, his age was hard to determine. He had scruffy dirty blond hair that you could almost call curly but technically had to classify as wavy. The only grey hair to be found on this man was in a very trim, George Lucas beard that seemed to exist in hopes of adding some definition to a jaw line that was practically buried in a surplus of neck flesh. His red flannel shirt was rolled up at the sleeves exposing some beefy, sawdust-covered forearms. This poor shirt did all it could to keep an industrial-strength gut at bay. Below this gut, in the order of their appearance, was a tool belt, faded jeans and dark-colored work boots. He walked over to a water fountain next to the men’s room door and inhaled water in an effort to replace the water lost in a glorious sweat mark that covered half of his back. The disgusting way he slurped and allowed his beefy mouth to touch the nozzle was the very reason I avoid water fountains altogether. To make matters worse, he began putting his hair and face into the stream of water which caused his germ-stacked hair to slide over the nozzle like the long strips of a felt curtain sliding over a car in a car wash. He brought his head upright and shook it around like a dog exiting a pond, spraying water everywhere. As he made his way back, he noticed Linda leaning against the wall. He picked her up, examined her with great curiosity and brought this unique piece of lumber into his workspace. Needing some small sturdy blocks, he placed Linda in the tray area of his compound miter saw and began to mercilessly cut Linda into pieces. The saw seemed to struggle a little as it went. 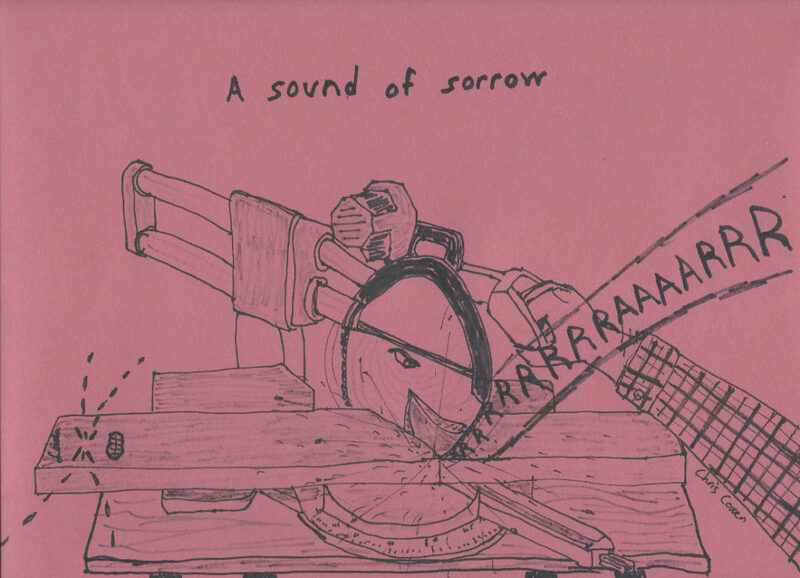 The sound it made was one of sorrow. I paced in the front hall, writing some notes while I waited for Ripps and Stever to return. Stever was the first to make it back. “You find anything?” I asked him. “Ha. That’s great. Where did you see…” Before I could finish, Ripps flew into the foyer area in a panic. I had not known Ripps for that long but I felt this was a state he was rarely in. I would never had told him this but there was something almost geekish about his panic. “No Ripps, I thought she was with you. 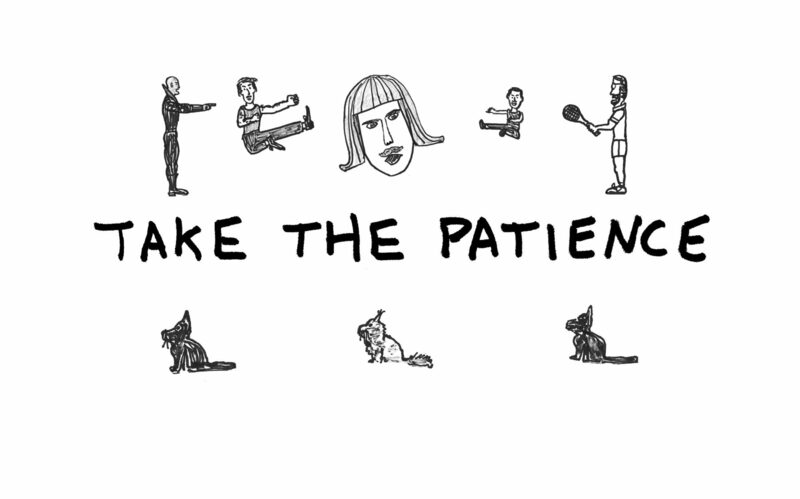 Try to relax. Where did you last see her?” I couldn’t believe I was talking about a piece of wood this way but he was very distressed. It was as if the loss of this inanimate object brought back some childhood terror. As I later found out, Ripps had a toy robot when he was a child that he named Linda. One Sunday afternoon, as his father was watching the New England Patriots lose, he was putting the finishing touches on a 12-pack of some pathetic brand of beer. Ripps was in the corner of the family room playing with his robot. His father heard him call his toy “Linda” which sent him into a rage. “Boys don’t call their toys, Linda! What’s wrong with you? !” Ripps’ father ripped the toy out of his son’s hands and whipped it against the fireplace, causing the toy to shatter into an uncountable number of pieces. Ripps’ sight was rendered useless with the thick warm layer of tears that coated his eyeballs. His father gruffly walked out of the room and left Ripps to pick up all the pieces of his robot. Flustered and emotional, he at first didn’t feel the burning heat of the fire as he went to rescue the pieces of Linda that fell into the fireplace. He had to go to the emergency room to treat the burns he received from getting too close to the flames and from the pieces of melting plastic he touched with his hand. There was a part of Ripps that burned himself on purpose – that was his way of punishing his father. Ripps would watch his father’s face with a dark joy the few times he uncomfortably lied to a couple friends or family about how Ripps received his burns. “I put her down near the last camera we fixed…I went to take a leak…gone, she was gone.” Ripps finished and there was a silence that lasted a few moments.